Founded out of HK in 2008 as an online platform and social media website, 9GAG is now one of the entertainment industry's greatest startup success story. With a team spread across HK and Mountain View it is considered as "the best source of fun". The team took part in programmes such as 500 Startups and Y Combinator as well as raised funds from prominent venture capitalists at the likes of First Round Capital, Greycroft and Chris Sacca. 9GAG's achievements may already be the stuff of legends, but this is only just the beginning. 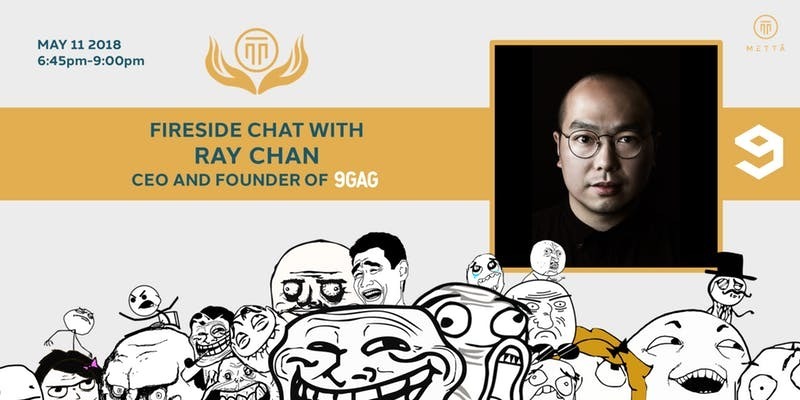 Join us for a fireside chat with Ray Chan, CEO & Founder of 9GAG, as we learn about the opportunities and challenges that led Ray and 9GAG to where they are today, as well as Ray's vision for the future of the business, the media/entertainment industry, and Hong Kong. ** Audio and video content may be recorded by the Mettā team.